If you guys haven’t heard the recent news yet about your favourite Toronto artist, Drake has been in Miami giving back to the students, families and shelters! It started with surprising Miami Senior High School! The notorious rapper was seen not only dancing to his hits with all the students but as well as shooting for his upcoming music video! The viral video has been going around with “God’s Plan” playing in the background and it seems like Drake and his team were having the time of their lives with the students! It’ll definitely be a music video to look forward to in the near future! Not only was Drake out doing business but he was able to give back to the school. He donated $25,000 to the school. Not only was he able to donate a huge portion of his money towards Miami Senior High School, but the students are now waiting for their OVO inspired uniforms that Drake has in the works for them! It doesn’t just stop there! Drake also awarded a lucky student with a scholarship in order to continue her post-secondary education. He awarded student, Destiny James with a $50,000 scholarship! Not only had drake given back to the students but he as well gave back to the community. Specifically, Drake was found to have paid for everyone’s grocery in a local Miami supermarket. The generosity keeps going as he had also donated to non profit organization, one being a Miami homeless shelter. He not only had donated $50, 000 to the shelter but as well had given gift cards to stores for all the females residing in the shelter. 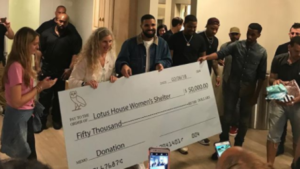 Drake gave back to the community in every way possible he could and it’s definitely one for the books! The Rap Up, Episode 24.